I’ve written here before about my appreciation of the films of M. Night Shyamalan and my continuing puzzlement about the intense hostility he faces with each new release, from both audiences and critics. Why is he singled out when there are many far less able directors whose work is given a pass? The accusation that he’s far too arrogant (giving himself small parts in many of his films) doesn’t explain it – name a major filmmaker who doesn’t have a big ego. And yet people go after him with a willful aggression out of all proportion to the supposed faults of any particular movie. So I was cautiously optimistic when his latest feature, The Visit (2015), received some fairly positive reviews. Admittedly, many of these were a bit back-handed – along the lines that, even if it’s not very good, it’s a partial return to the genius of The Sixth Sense. I was very gratified, however, to read Adam Cook’s review in the latest issue of Cinema Scope, which manages to express everything I think about Shyamalan’s work but with far more clarity than I could do it myself. My feeling has always been that the main problem is Shyamalan’s unguarded expression of his beliefs, that the supernatural elements of his work are not merely narrative gimmicks, but rather rooted in his Hindu upbringing and the view of life expressed by that religion. Because of this, there is a complete absence of irony in his work and our postmodern sensibilities are made very uncomfortable by this kind of sincerity. We almost reflexively see it as either hypocritical or embarrassingly naive, and all too often we mock the idea that redemption is genuinely possible. Just a couple of weeks ago, Larry Wilmore on Comedy Central’s The Nightly Show took yet another opportunity to throw in a completely gratuitous snarky comment about Shyamalan, ridiculing The Happening as a movie in which Mark Wahlberg is chased around by the wind for an hour-and-a-half. Now, there have been a vast number of stories about nature turning against mankind for all the damage we’ve done to the planet, from The Day of the Triffids to No Blade of Grass to Grizzly and Day of the Animals … if anything, Shyamalan’s treatment of the theme is far more subtle than most of them, yet it was almost universally reviled by people who were completely unwilling to go along with the premise … even people who probably had no problem with John Wyndham’s walking, poisonous, flesh-eating plants. No fantasy can stand up to that kind of resistance to its core narrative element. Nana, what a big oven you have! Given the slightly more favourable reception afforded The Visit, it’s interesting to note that despite initial indications, the story’s horror is finally revealed to be non-supernatural. I’m not sure that this alone could explain the change; but perhaps there’s a sense of relief that Shyamalan has eased up on the spiritual element in this new work. Or maybe it has something to do with the fact that this time he hasn’t given himself a small supporting role. Whatever the underlying reasons, with The Visit at least some critics have been able to see more clearly that he has genuine skills as a writer and director (skills which have been quite evident in many of his previous films, but too often not acknowledged because of the strong prejudices through which those films have been viewed). Smaller in scale than his more recent films, and seemingly much more personal, I initially saw The Visit as a kind of updating of the brief kids’ horror cycle of the late ’70s and early ’80s, best exemplified by the work of John Hough – Escape To Witch Mountain (1975), Return From Witch Mountain (1978) and The Watcher in the Woods (1980). Watching it again on Blu-ray, it seems a much stronger and deeper film. 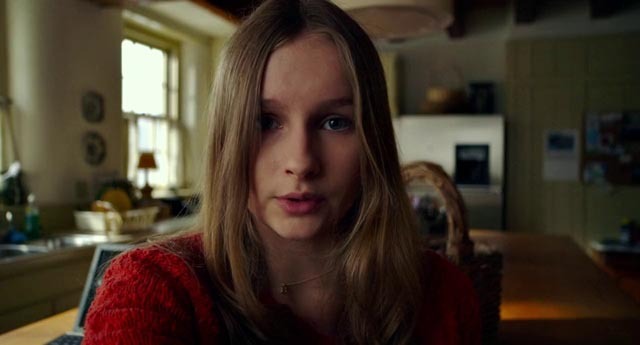 Using the tropes of found-footage horror, Shyamalan has crafted an emotionally rich and genuinely creepy study of the tensions and insecurities at the heart of the family, the conflicts, attachments and animosities which exist between parents and children and between siblings. Two adolescents, emotionally troubled by the desertion of their father a few years earlier, and dealing with their single mother’s tentative new relationship, insist that they be allowed to spend a week with her estranged parents while she goes on a cruise with the new boyfriend. Although the mother is unwilling to discuss it, there is some event in her past which created a rift between her and her own parents and her daughter is determined to heal that break. Her chosen method is to make a documentary about the family and thus she and her brother record the events of the week on two cameras. I’m tempted to say that Shyamalan uses this device more skillfully than any of his numerous predecessors. Rather than waving the cameras around in a dizzying attempt at some kind of “realism”, much of it is carefully shot in a way which reinforces the precocious self-possession of the daughter in particular. 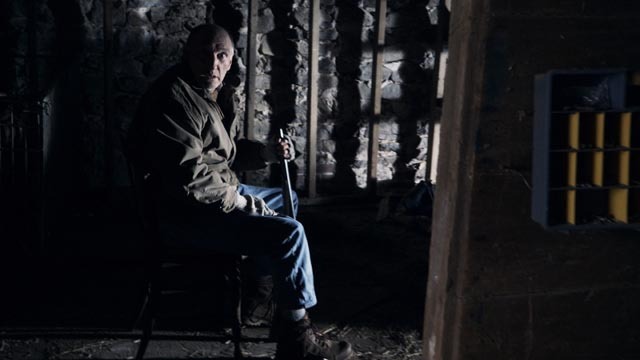 The use of two cameras allows for some exceptionally well-staged sequences – the impromptu game of hide-and-seek in the crawlspace under the house which abruptly turns nightmarish is a fine example of action staging and editing. Beyond the daughter’s probing of the hidden history of the trauma in her mother’s family, the film adds an additional layer rooted in the uneasiness the young feel in the face of the mysterious and occasionally frightening physical and psychological consequences of ageing. While the old couple who meet the kids at the station are cheerful and welcoming, it doesn’t take long for disconcerting things to surface. While the boy is quickly creeped out, his more mature sister expresses empathy and understanding … until things can no longer be explained away and the film reaches its climactic revelation. Yes, there is a twist, but it’s organic to the narrative and actually deepens the themes of family tension and the aching desire to connect and belong. The Visit seems almost effortless, its genuinely disturbing elements enhanced rather than undermined by touches of humour. But most of all, it’s an excellent demonstration of Shyamalan’s skill with actors. The performances are all natural, layered with subtle psychological nuances, and even the “monsters” elicit audience sympathy and understanding. Olivia DeJonge as Becca and Ed Oxenbould as Tyler are excellent as the kids, convincingly precocious without ever being cloying, their emotional strength tempered by the insecurities caused by their father’s departure – in fact, that precociousness is at least in part a compensatory mechanism for feelings of worthlessness triggered by abandonment. As Nana and Pop Pop, the old couple, Deanna Dunagan and Peter McRobbie shift effortlessly from humour and charm to a chilling alienness and back; the distance between youth and age at times seems unbridgeable, only to suddenly vanish in empathy and understanding. In the smaller role of Mom, Kathryn Hahn provides just the right note of emotional support to create the space the kids need to find their own inner strength. Yes, the film does terminate in several moments of shocking violence, but even these ultimately support the redemptive conclusion, reasserting once again Shyamalan’s emotional openness. Watching The Visit a second time, on Blu-ray, it strikes me as possibly the finest work of M. Night Shyamalan’s underrated career. This entry was posted in Commentary, Review and tagged Blu-Ray, Directors, Horror. Bookmark the permalink.